On July 26, 1896, the first permanent home for showing movies in the United States was opened at 623 Canal Street, corner of Exchange Alley. 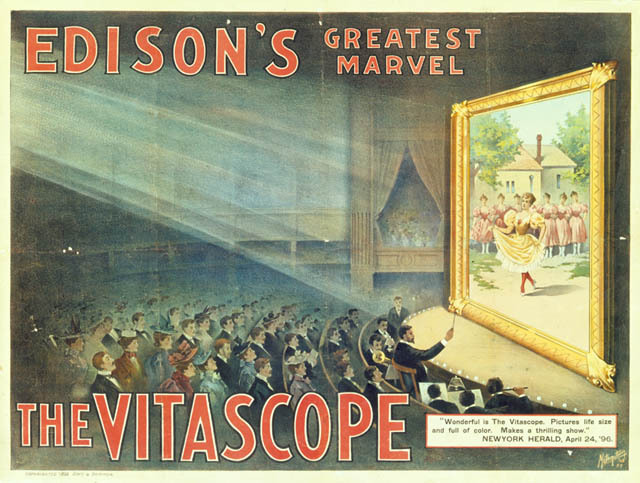 The name of the theatre was Vitascope Hall. Cost for admission was 10 cents. For an extra 10 cents, you could get a look into the booth where the man was operating the vitascope. If you really wanted to splurge, for another 10 cents you could get a frame of discarded film. Some noted people said it was a fad that would soon pass. The theatre accommodated 400 people and had two shows per day. The first was from 10 a.m. to 3 p.m. The theatre was reopened at 5 p.m. and stayed open until 10 p.m. Movies in 1896 were not long movies like today. They were made up of little skits strung together very loosely. They usually consisted of a fight scene, a floozy doing a hoochy-coochy dance, slapstick comics, and possibly even an embrace ending with a long, lingering sensual kiss. America’s most cosmopolitan city is known for its cultural "firsts" which include being the birthplace of both jazz and Creole cuisine, having the country’s longest continuous operatic history, the oldest continuous community theater and, remarkably, the first movie house, Vitascope Hall, and its first public showing of a motion picture in America. The location is now a Burger King.